Edna Cheretei, a peace activist and her husband Daniel Loktari, a retired teacher, have made their home a rescue centre for children in a community faced with rampant cases of female genital mutilation, early marriages and violence resulting from cattle rustling and tribal frictions, among other challenges, Daniel and Edna have taken upon themselves to be the father and mother of the innocent kids caught in the middle of these dangers. They host children from all communities including those from the Tugens Ilchamus and Turkana communities that have been orphaned by the violence often caused by Edna’s own community--the Pokots of Baringo County. Their work is sensitive--Edna and Daniel risk being marginalized by their own (Pokot) community for hosting children from tribal “enemy” communities i.e. the Tugens, Illchamus and the Turkanas. But the two are determined to bring peace and hope to their area, no matter what risks and challenges they may face. So far they’ve offered a home to 17 children, providing for all their basic needs including education, shelter and food. It takes a lot of love and commitment for them to do this work given the challenges of finding food in the region and dealing with tribal sensitivities. 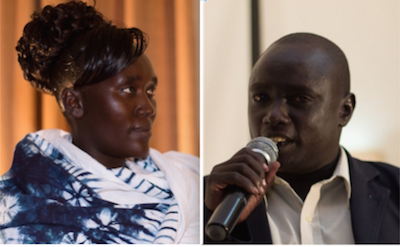 Giraffe Heroes Kenya wishes to recognize Edna Cheretei & Daniel Loktari for ‘sticking out their necks’ for the common good and for their desire to lighten the loads, strengthen the hearts, and improve the lives of those in their circle of influence.